Bye Bye Lacrimae | GALAPIAT EN VOYAGE ! The people in the festival come to see each other, we meet at the catering, give flowers when we leave. 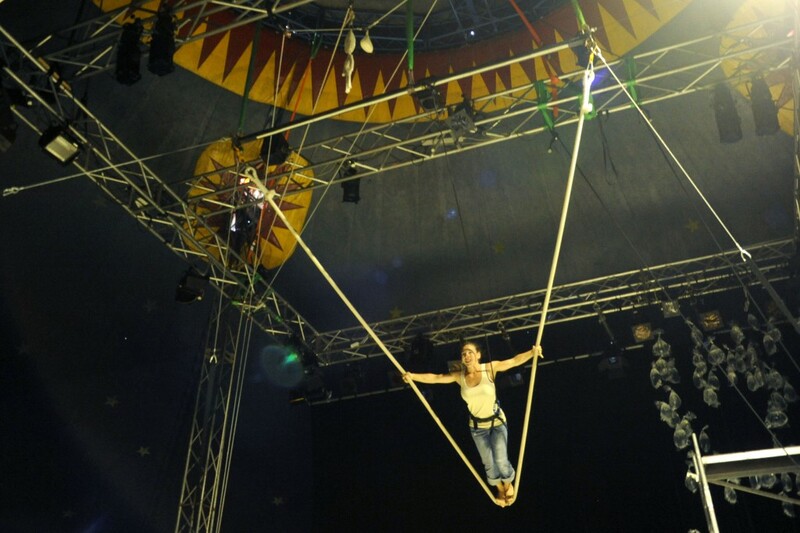 Trapeze lesson in the yellow Big Top. It’s informal, it’s improvisation, we (nearly) all want to try. Our teacher : Elice. Flying rope lesson in the red Big Top. When we saw the act in Lacrimae’s cabaret the other night, Helene wanted to fly… The teacher : Fanny from the company « Cahin-caha ». The artists fo the cabaret are from Sweden, Finland, Czech Republic, Spain, France. The three circus companies had 5 days to produce this show. Long white strings bind them together. That’s their idea, their setting. They knit, they weave, they spin for one hour and a half. It’s a short lived show. That’s it, it’s over ! Most of the artists have left today. Perfoming Arts are made from the instant, from what arouses, from what disappears. Every day, each one of us gets over the no longer existing moment and tries to make the most of the constantly renewed present ones. Everybody knows this feeling. It’s the artists’ daily bread. Matthieu got a foot injury. He has a bruise. Hélène and Matthieu went to the hospital. Nothing’s broken but for tonight and 5 more times, they will need to adapt the show. They don’t seem to panic. They know that the body can broke, get injured. It’s part of the game. There are days when you win, some others, when you lose. There are even days when you’re offside. After « Lacrimae », some other artists will show us their prowess and poetry. They are fitting up this morning. 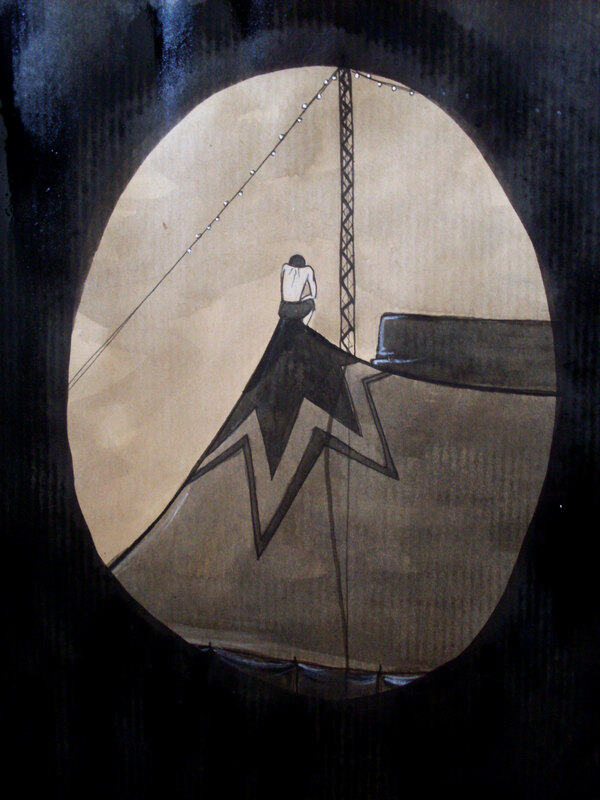 One of the artists falls from the high up in the Big Top. Nothing serious but he won’t be able to perform tonight. We have done half of the performances here. Many friends have left. Bye bye Lacrimae and hop !